Crusty, cheesy, spicy. Photo courtesy Pepperidge Farm. A palmier (palm-YAY) is a sweet or savory cookie made from puff pastry; the pastry is folded to resemble palm leaves (palmiers) or elephant ears, depending on your perspective. The sweet versions are rolled in sugar; the savory versions are made with cheese—a variation of cheese straws. 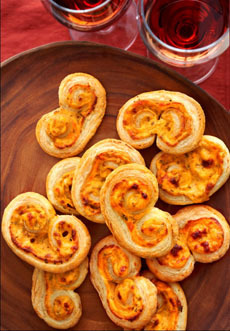 For something spicy and warm from the oven on New Year’s Eve, we like this recipe from Pepperidge Farm. Parmesan palmiers with a kick of hot sriracha sauce are a smashing pairing with with Bloody Marys, and you can serve them with sparkling wines, too. In this version, sriracha, the hot sauce that originated in Thailand, adds a kick. 1. HEAT the oven to 400°F. Line 2 baking sheets with parchment paper. Stir the cream cheese, sriracha, onions and cheese in a medium bowl. 2. SPRINKLE the work surface with the flour. Unfold the pastry sheet on the work surface. Roll the pastry lightly to remove the fold marks. 3. SPREAD the cream cheese mixture on the pastry to within 1/2 inch of the edge. Starting at both short sides, roll the pastry toward the center, leaving a 1/4 inch space in the center. Fold one side over another, making a layered roll. Cut the roll into 20 (1/2-inch slices). Place the slices, cut-side down, on the baking sheets. 4. BAKE for 20 minutes or until the pastries are golden brown. Remove the pastries from the baking sheets and let cool on wire racks for 10 minutes. How do the two red chile-based sauces compare? Sriracha is a thicker sauce that pairs red jalapeños with garlic and vinegar, along with a bit of sugar for balance. The result is a more rounded, balanced sauce than original Tabasco. While the original sriracha sauce hails from the Thai seaport of Sri Racha (also spelled Si Racha), the popular Huy Fong brand is made in California. Tabasco, the classic American hot sauce, is a thin condiment (as opposed to the thicker sriracha, which is sauce-like). It is a less complex flavor profile than sriracha, made with Tabasco chiles and vinegar. In recent years, McIlhenny, the Louisiana-based producer, has expanded the line to seven varieties of Tabasco, including Garlic and Sweet & Spicy.